Our customer, A.J. Mellott, from University of Kansas Medical Center presented the poster “Engineering Building Blocks for Efficient Cell Growth, Migration, and Differentiation in Tissue Engineering Applications” at the World Congress of the Tissue Engineering and Regenerative Medicine International Society (TERMIS, 2018) in Kyoto, Japan. 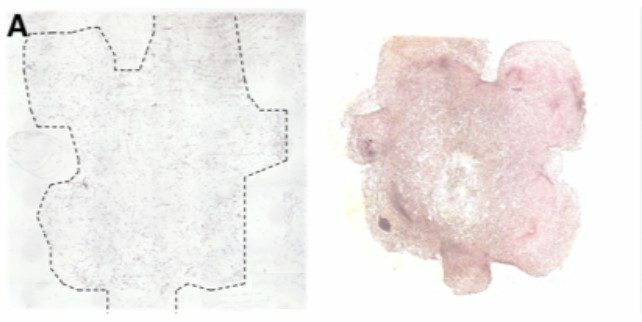 The purpose of the study was to demonstrate a novel platform technology for growing MSCs in 3D expandable substrates for use in creation of organoids and sophisticated tissues. Construction of 3D expandable Tissue Blocks (T-Blocks) could provide a strategy for growing healthy mesenchymal stem cells (MSCs) for generation of organoids and sophisticated tissues. MSCs were encapsulated in Matrigel then 3D bioprinted in T-Blocks using the BIO X. Spinal cords from euthanized mouse embryos were harvested and cultured on top of the T-Blocks for three days before the constructs were analysed. They conclude that T-Blocks enable MSCs to grow efficiently in 3D, and provided a scaffold design that could be beneficial for tissue engineering applications.